I am using a torrent to distribute the iso file so you need a bittorrent client to download it. I recommend µTorrent if you don't have a torrent client installed. Download this torrent to start downloading the test disk. Please seed to support the project and saving me from infinity sharing. I recommend you use ImgBurn to burn the iso file to disc. If you already installed AVCHDCoder you can go to Tools and choose ImgBurn. After you launched ImgBurn choose "Write image file to disc". Then click on File --> Browse for a source file. 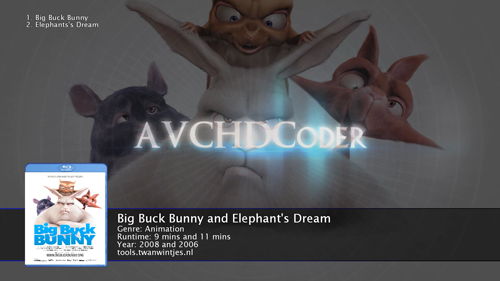 Choose the mds file in the downloadfolder (AVCHDCoder - Big Buck Bunny - Elephants Dream (AVCHD)). Enter an empty dvd. I recommend a writing speed of 4x. Then click on the large Write button to start burning the iso. You can also use Nero to write an iso file.